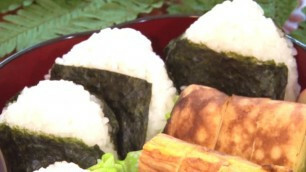 This recipe introduces ONIGIRIs of ONIGIRI BENTO and ASAZUKE(means lightly pickled) CUCUMBER. tuna with mayonnaise, okaka (finely chopped katsuobushi dressed with soy sauce), tarako (cod roe), etc. Here we will introduce ONIGIRIs stuffed with okaka and kombu tsukudani. kombu tsukudani, soy sauce, salt, toasted nori(dried laver) sheets. The ingredients of ASAZUKE CUCUMBER include cucumbers, salt and kombu dashi(kelp stock) granules.